Fa unes hores que ha marxat la Paula. Després d’aquests dies que hem passat plegats, guardarem per sempre el record del seu somriure i de les bones estones compartides. Aquesta és una de les fotografies que ella va fer, ben aviat segur que en veurem moltes més en el seu blog. Moltíssimes gràcies Paula per la teva amistat! Paula left a few hours ago. After the days we spent together, we will forever hold our memories of smiles and good times shared. This is one of the photographs she took. Surely we will see more of them in her blog. Thanks a lot Paula for your friendship! This entry was posted by Montserrat Lacomba at 11:38 am. | This post has 2 responses. 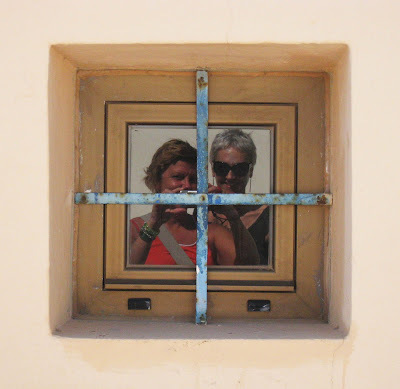 This post is filed under Blog, Formentera and tagged with Formentera, Paula Lindblom. We will absolutely share a lot of good memories but also our friendship has become something else, something new after our meeting in "real" life. I’m so grateful from my bottom of my heart that you invited me to your paradise, I had a really, really good time with you and I will always remember it as happy and good and also very, very interesting. I will post my trip to you in august, when I’m back on track. Just now being at home in Gothenburg for some hours, I will always remember this trip and the time together with you and your husband. Thank you, thank you and thank you once again!